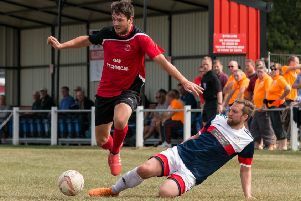 Rudy Funk praised everyone affiliated with his AFC Mansfield side after they concluded their league campaign with a 2-1 victory at home to Athersley Recreation. The Bulls were able to claw their way back from a one-goal deficit to end the season on somewhat of a high – bouncing back from Wednesday’s defeat to Pontefract Collieries. However, his side must wait to know their promotion fate. Rivals Pickering Town need a minimum of five points from their remaining three games to condemn AFC to another season of football in the Northern Counties East League Premier Division. Funk said: “To finish with a total of 96 points is a great achievement and it stems from everyone involved with this great club. “The lads have been absolutely amazing at times, but I do think we lost our nerves a little towards the end. Since November, sitting at the top of the table means everybody wants to have a good game against you and that’s just how it is. In what was a relatively strange game at the Forest Town Arena, Athersley’s Joe Singleton gave his side the lead on 27 minutes. A towering header from an in-swinging corner left Jason White no chance. AFC searched for a route back and their talisman, Oliver Fearon, bore fruit just shy of the half-time whistle. Tussling with the visitors’ goalscorer, he latched onto a long ball and lifted it over the on-rushing ‘keeper. Matty Plummer then turned the game on its head after hooking a bobbling ball into the top corner on 52 minutes. Things looked relatively comfortable before White lashed out at Danny South – subsequently receiving a straight red card for violent conduct in the 54th minute. With no substitute goalkeeper, the Bulls saw out the remainder of the match with none other than 45-goal-man Fearon between the sticks. Keeping a clean sheet and a couple of saves to accompany it, the home side held out for all three points.